ARIES running boards and side bars are designed for two things: unique style and a no-drill fit. Whether you're building the ultimate custom Jeep Wrangler or just adding some functional footing to your pickup truck, ARIES offers that aggressive, aftermarket look. A growing number of ARIES running boards for trucks are equipped with our VersaTrac® system, a no-drill mounting system that allows a single set of brackets to accommodate various running board options. Select your vehicle and find ARIES running boards that accent your style. ActionTrac™ running boards are the next generation of power running boards with their innovative step-within-a-step™ design. They provide two steps in one for easier access into the vehicle, especially on larger, lifted Jeeps and trucks. 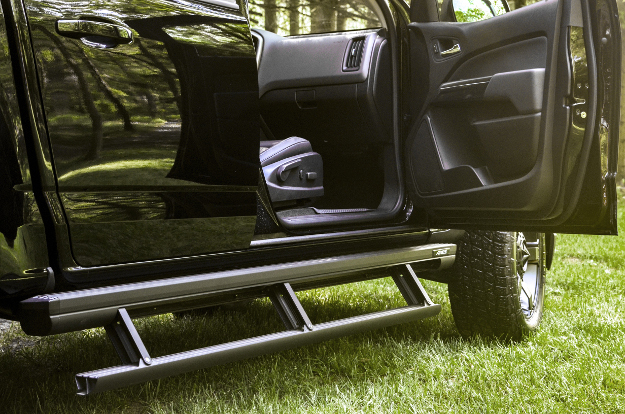 ActionTrac™ powered running boards are constructed from powder-coated aluminum and keep the retractable steps, pivots points and all electrical components contained within the housing for superior weather resistance. ActionTrac™ installs with no-splice wiring and no-drill brackets on most models. 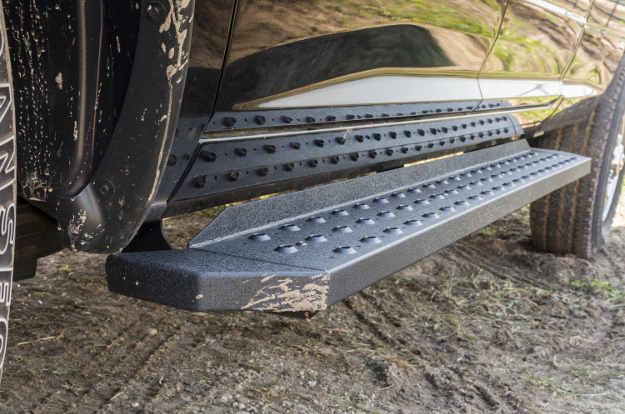 With an all-steel construction and high-traction metal treads, RidgeStep® running boards are suitable for work or offroad trucks. They provide a solid stepping surface and feature an angular design for a no-nonsense look. The powder-coated steel construction of these truck running boards and their stamped steel treads provides exceptional wear resistance. RidgeSteps® install with the ARIES VersaTrac® system for easy mounting and customization. Styled after the classic look of many popular original equipment nerf bars, ARIES 6" oval side bars add style and functionality to your truck or SUV. They come with non-skid poly step pads and bold black end caps. ARIES 6" oval steps are available in two finish options, including polished stainless steel and black powder-coated aluminum. All sets are made for vehicle-specific application for a custom fit with no drilling required. 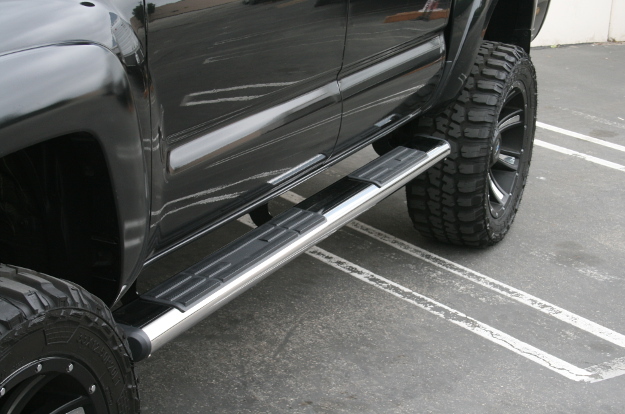 ARIES AdvantEDGE™ side bars are truly a unique running board option for your truck, offering an aggressive, aftermarket style with the durability to back it up. In addition to their angular design, AdvantEDGE™ truck steps are made entirely from powder-coated aluminum, including the boards and durable, non-skid step pads. AdvantEDGE™ side bars are part of the AdvantEDGE™ series and are available in a carbide black or chrome powder coat finish. They install with the VersaTrac® system with no drilling required. 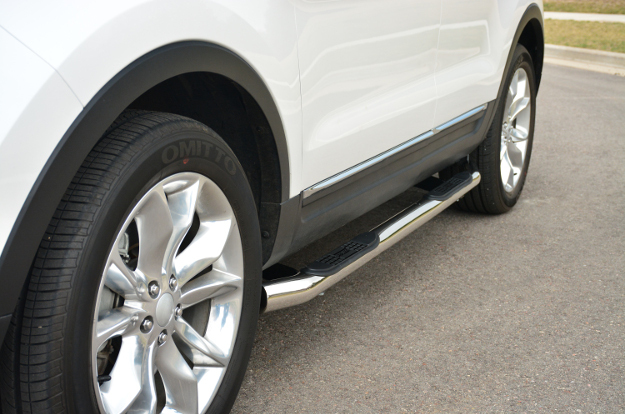 Give your SUV a modern, urban vibe with ARIES AeroTread® running boards. 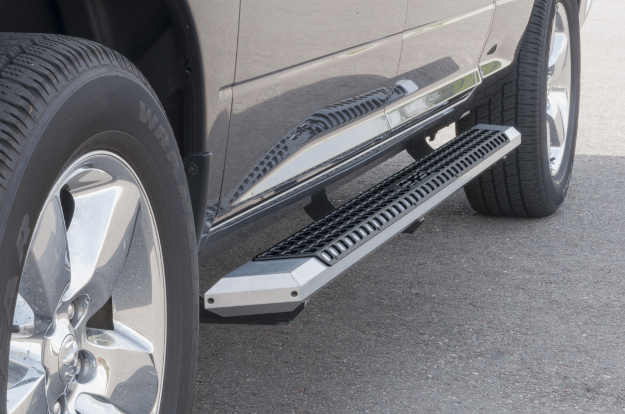 These sleek side steps are designed uniquely for today's sport utility vehicles, featuring a lightweight, dual construction of aluminum with a stainless steel front trim piece. AeroTread® SUV running boards are available in two finish options -- polished or black powder-coated stainless steel -- and each set is made for a custom fit with no drilling or mods required. ARIES 4" oval side bars are a classic nerf bar option with a uniquely stylish twist. They feature a sleek, elliptical tube profile with 20° bent ends to contour to the body of the vehicle, as well as seamlessly blended end caps for a superior, finished look. ARIES 4" oval side bars also have raised, non-skid step pads for comfortable entry and exit, and they are available in two finish options. All sets install with no drilling required. Add big, bold, bad attitude to your truck or Jeep with ARIES Big Steps™. These 4" diameter side bars are uniquely designed for larger, lifted vehicles, providing a solid step and aggressive style. 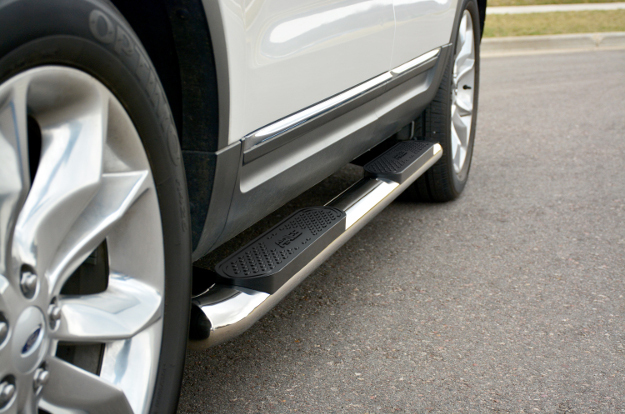 They are constructed from powder-coated aluminum to be lightweight and non-corrosive, and they feature raised, non-skid step pads for a safe, comfortable step up. Big Step™ 4" round side bars install with no drilling required, and they pair well with our Big Horn™ bull bar for maximum offroad attitude. 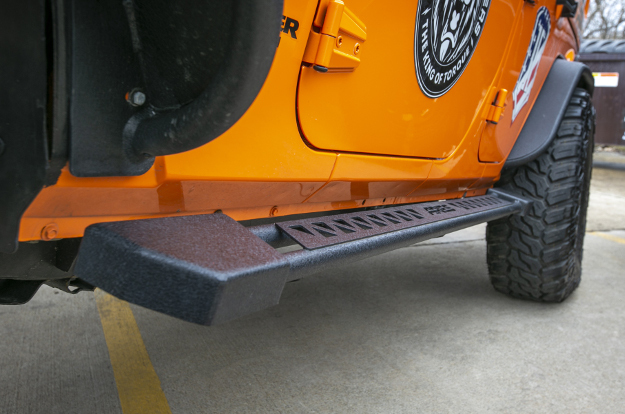 ARIES Rocker Steps are the perfect combination of side steps and rocker panel protection for offroad Jeeps and trucks. They provide a solid step up with a 3" welded top plate, while adding extra protection for the rocker panels with their all-steel, double-tube layout. 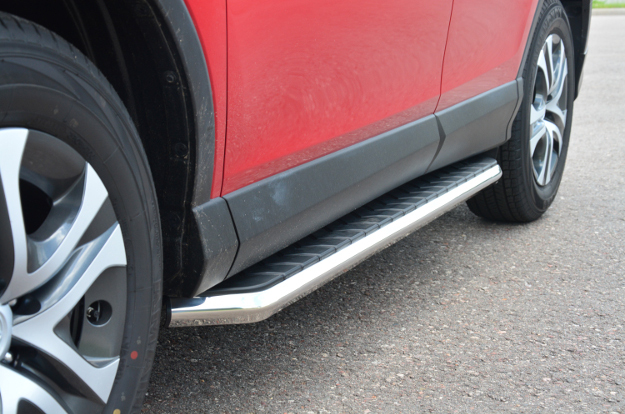 These offroad side steps mount with pre-welded brackets for enhanced rigidity and an easier installation. 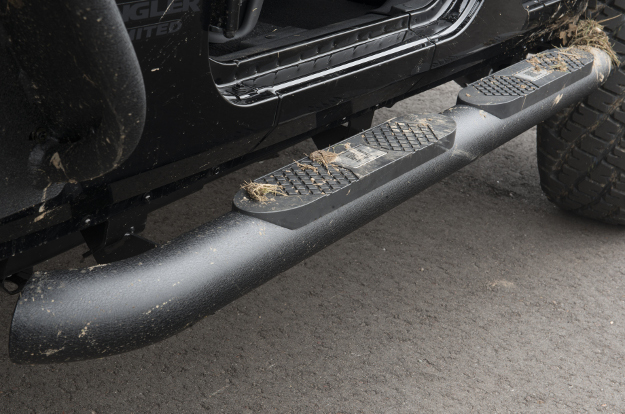 They also mount high-and-tight against the rocker panels, providing plenty of ground clearance for obstacles on the trail. ARIES offers a wide selection of 3" side bars, giving you a traditional, customized style for your vehicle and dependable, non-skid footing. We carry side step bars for hundreds of applications, including many older trucks, and each installs with no drilling required. ARIES 3" side bars are available in three finish options, including polished stainless steel, black powder-coated stainless steel and black powder-coated steel. All are vehicle-specific for an original equipment look and feel.